Indian Jewelers Call Off Strike. NEW DELHI—India's gold-jewelry trade associations agreed Friday to call off a 20-day strike, after Finance Minister Pranab Mukherjee promised to look into rollbacks on newly implemented gold taxes. Indian retailers have been protesting measures, effective March 16, that doubled the import tax on gold to 4% and imposed excise taxes on most gold jewelry. Earlier, the excise tax was applicable only on gold jewelry sold by large, private companies.Imports by India, the world's top consumer of gold, have nearly stopped due to the strike, impacting global prices. New York: Gold on Wednesday dropped to a 12- week low by losing 2.6 percent as the dollar strengthened on signs the Federal Reserve may refrain from providing more monetary stimulus for the US. 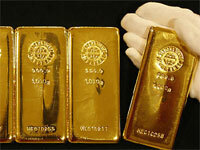 The gold fell by 2.6 percent to USD 1,628.10 an ounce, after touching USD 1,621.50, the lowest since January 10. Silver also fell by 4.1 percent to USD 31.90 an ounce, the biggest drop since March 14.